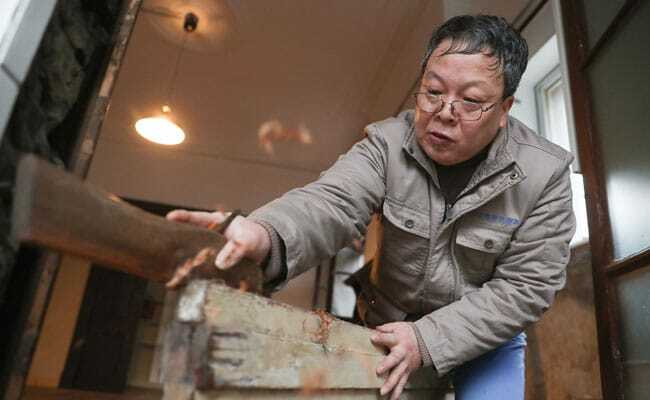 Carpenter Ma Jiale has spent much of his working life lovingly repairing some of Shanghai's most attractive -- if rather decrepit -- historical buildings. Authorities say they are committed to preserving the best of the old structures -- and Ma is doing his part. The 57-year-old grandfather cycles -- old tools hanging from the handlebars -- from job to job in a pocket of the northeast district of Hongkou. "If Shanghai only has skyscrapers, then it is not Shanghai any more," said Ma, known affectionately in the neighbourhood as "Master Ma". "I am not saying modernisation is not good, but historical buildings should be preserved," he added. Past residents included writers, a Communist Party leader from the late 1920s and, according to local legend, one of Mao Zedong's ex-wives. Now divided into several rather ramshackle apartments, Ma said that Japanese used to live there -- Hongkou was once known as "Little Tokyo". They include arched floor-to-ceiling front windows, high ceilings and a grandiose tiled fire place. "The meaning of my job is to protect historical buildings and pass on our craftsmanship," said Ma. "What is made by machines is cold and lacks a human touch." After the Communist takeover 70 years ago, political campaigns denouncing symbols of China's past "feudal" era consigned many properties to decay. But in a country where people are often afraid of speaking out, Ma is open about what he feels is the inadequate upkeep of some of Shanghai's attractive old architecture. "We just roughly repair windows, doors, floorboards, wooden frames," said Ma, calling for more money to be directed to the preservation effort. "For decades Shanghai's historical buildings haven't been well protected Small repairs from property management companies cannot solve the big problem," he added. Ma will retire in three years and is eager to pass on his decades of expertise -- if only there were budding carpenters out there. In the neighbourhood where he works, there are only four carpenters for a population of more than 10,000 residents, he said. A major reason is the pay -- Ma works five days a week and earns about 5,000 yuan ($750) a month, half the average salary in Shanghai. For comparison, the 50-square-metre (550 square feet) apartment he was working on recently sold for five million yuan putting it on a par with central London prices. Ma said: "If needed, I'm willing to teach young people to do carpenter work. But it's still too difficult to find young people for this sort of job." He added: "I'm very worried that after three to five years, no one will inherit the skills and the protection work cannot continue."